The first chance of observing the Moon after ‘New’ is when a very thin crescent Moon becomes visible low in the west after sunset. 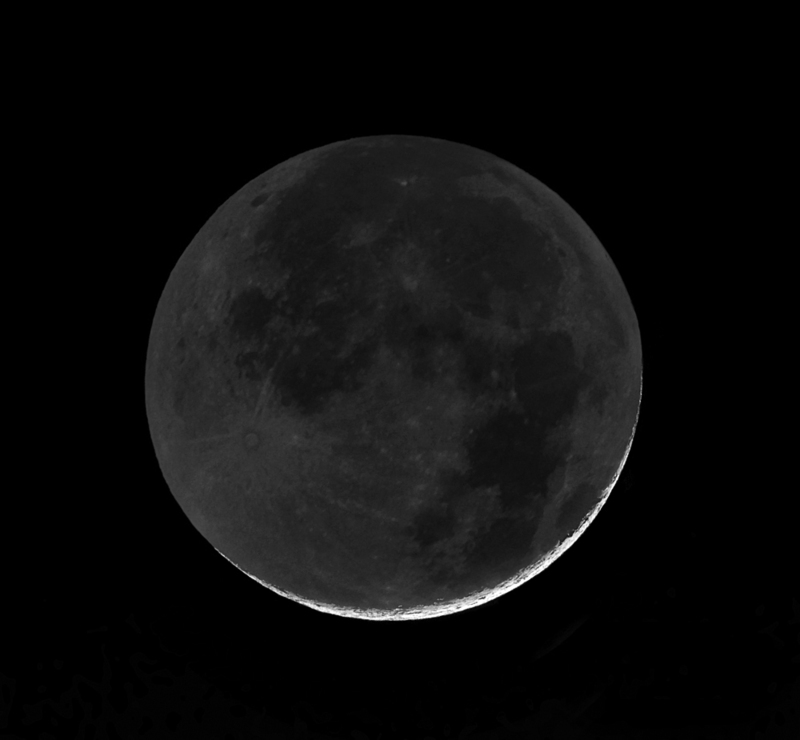 At this time (and also when seen just before dawn in the east) it may be possible to observe ‘Earthshine’ illuminating the ‘dark’ part of the lunar disk as shown below. This is a composite of two exposures; one to correctly expose for the bright limb and a second, with a considerably longer exposure, to expose for fainter parts of the surface. Over the next few days, the illuminated phase gets greater and, as the Moon moves further in angle from the Sun, it will be seen for longer after sunset and be higher in the sky. Below is an image taken by the author of the six day old Moon and the remainder of this article describes some of the more interesting features seen at this phase of the Moon. Due largely to the fact that the Moon’s orbit is elliptical but also that when we observe it at dawn and dusk our view point relative to the Moon is shifted from when we observe it on the meridian (the effect of parallax), at times we can see further round the eastern and western limbs than at other times. In fact, 59% of the Moon’s surface can be seen over time. This effect is called Libration. Virtual Moon Atlas (https://virtual-moon-atlas.en.uptodown.com/windows) can beautifully show the Moon’s libration by simply holding down the left mouse click over the ‘>>’ tab in the ephemeris command window. I found an image of the 5 day old Moon in my files that had been taken on the 7th January 2003 with a compact camera and 80 mm refractor using eyepiece projection. This is not a particularly good image compared with those that I can now take but, pleasingly, shows the effect of libration very well as seen in the comparison with the Day 6 image. Besides the six that are easily visible, there are two small maria, Spumans and Undarum close to Mare Fecunditatis. There are four further maria that can only be well seen when the Moon’s libration allows one to ‘see’ a little around the eastern limb of the Moon. 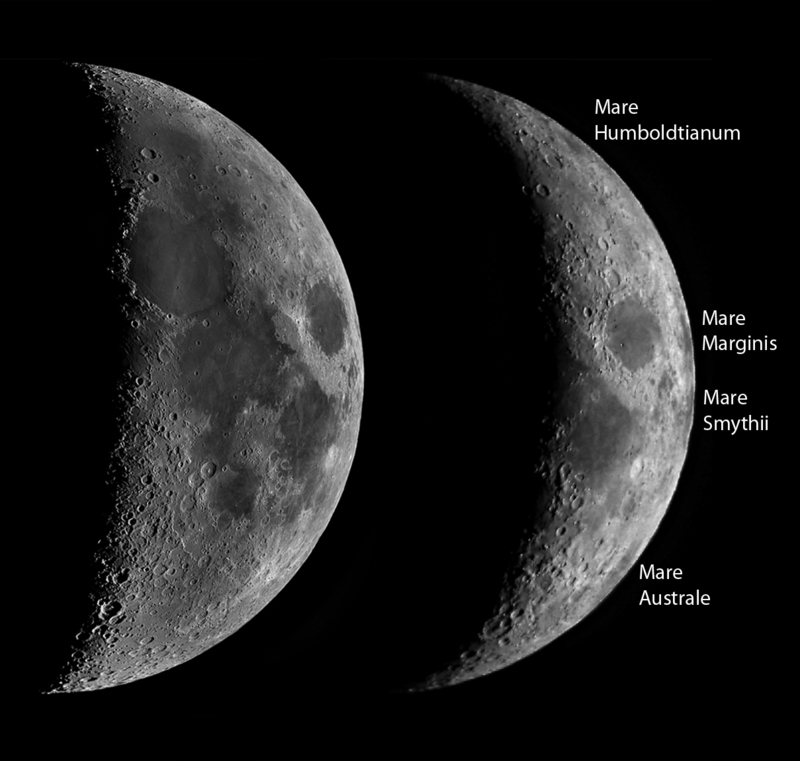 As shown in the comparison image above, these are visible at times with Mare Humboldtianum, Mare Marginis, Mare Smythie and Mare Australe seen in the day 5 image above. Mountain chains tend to be the found at the edges of the basins that were the result of major impacts and which were later filled with lava to form the maria. 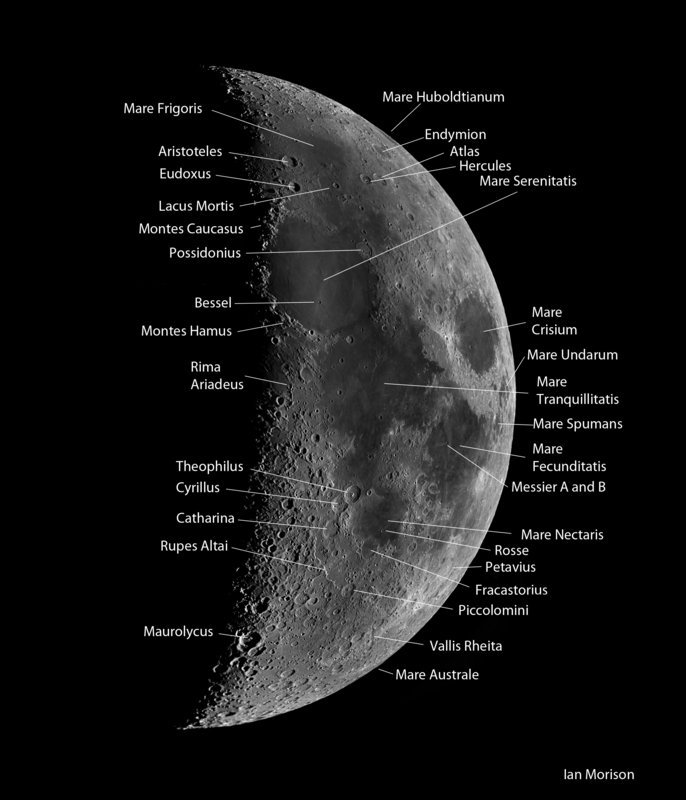 The two mountain chains, Caucasus and Hamus, seen at this lunar phase, are found on the western side of Mare Serenitatis. To the lower right of the visible disk is Vallis Rheita which has a length of 445 km and a maximum width of about 30 km. This secondary crater chain is radially orientated to Mare Nectaris so it may have been gauged out by 10 or more gigantic ejecta fragments when the Nectaris basin was formed some 4,000 million years ago. Many years ago some authorities thought that, as the vast majority of craters are round, they must have been the result of volcanic activity. They surmised that impacting objects, coming in from all angles would give rise to elliptical craters with their major axes aligned to the direction of travel. However, orbital mechanics indicates that these impacts would occur at velocities of up to ~70 km/sec and, as such, are termed ‘hypervelocity impacts’. In this case the impacting objects will burrow down below the surface before exploding as their energy is released. These sub-surface explosions naturally give rise to circular craters. 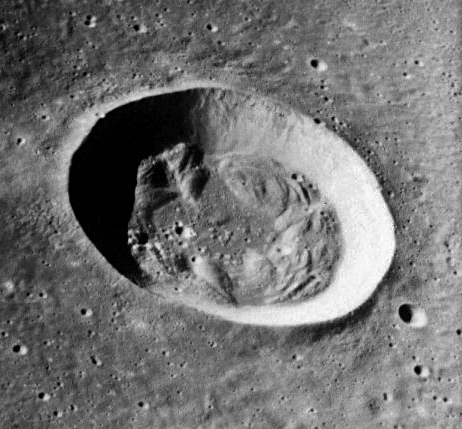 However, some very low angle impacts do produce elliptical craters (see below) and there are some volcanically produced craters visible on the near side such as those along the line of the Hygenus Rille seen later in the lunation. 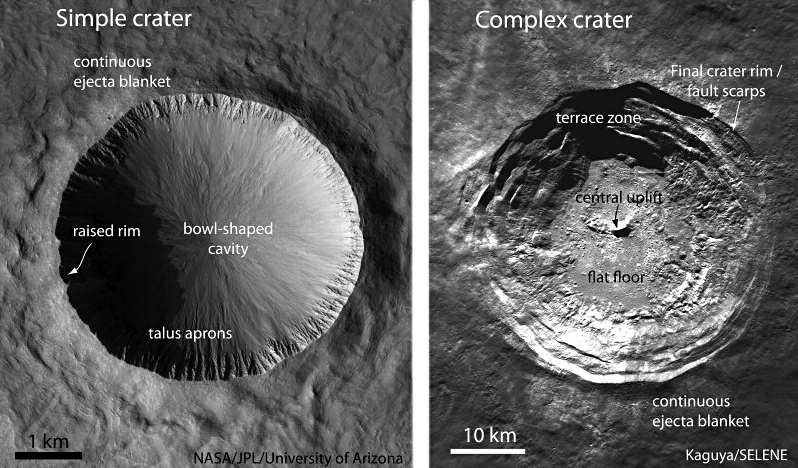 The figure below illustrates the two crater types, simple and complex. Small lunar craters with diameters less than about 15 km appear as smooth sided bowls having a small flat floor and whose depth is about 30% of their diameter. Their walls rise a little above the surrounding terrain and are surrounded by an ejector blanket as seen below. The, 5 km diameter, crater Rosse in the southern part of Mare Nectaris is an excellent example. 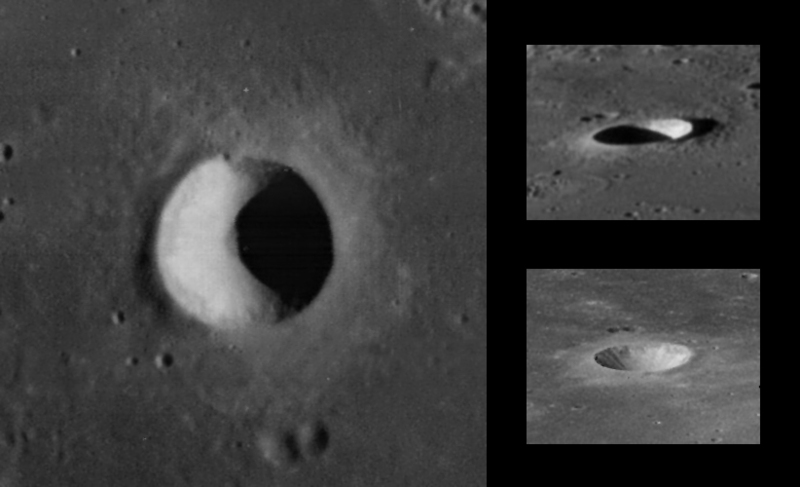 More energetic impacts, due to a combination of the mass of the impacting object and its impact velocity, create larger and more interesting craters. Massive pressure waves are created and one result is that deeply buried rock rebounds up into the centre of the crater giving rise to the central peaks that are usually seen. Such a large, deep and steep walled depression allows the surrounding rocks to collapse into it giving rise to a series of concentric terraces. 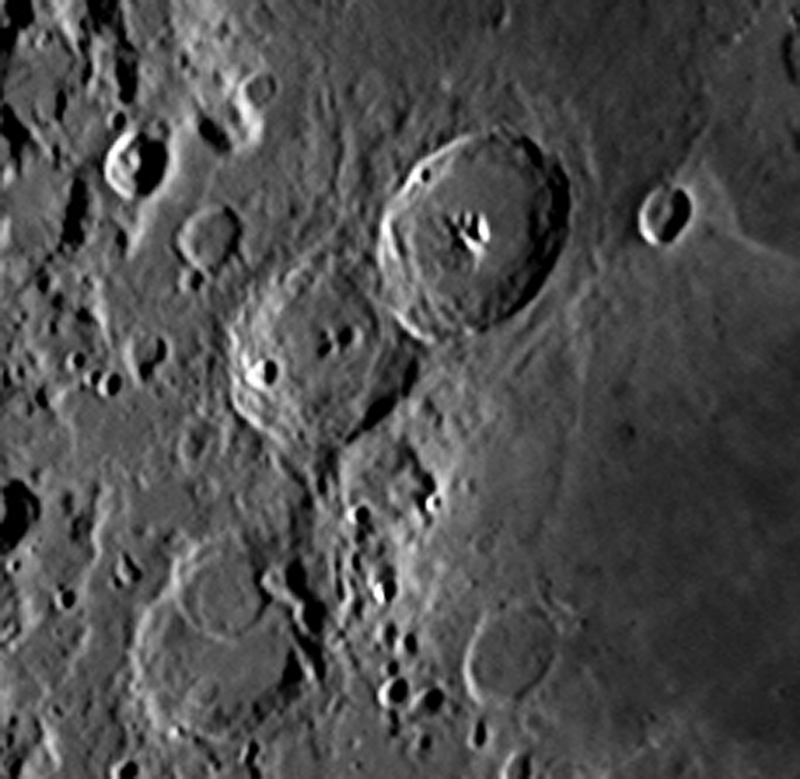 Aristoteles and Theophilus are perhaps the two best examples visible in the 6 day lunar image. 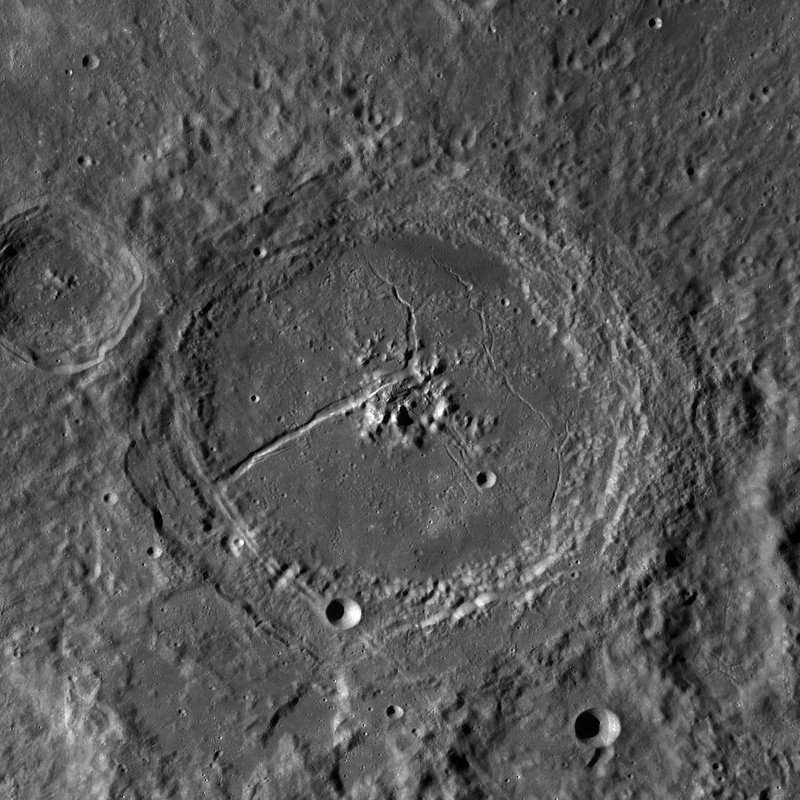 The smaller complex craters, with diameters 15 to 40 km in diameter, have walls that only slump in one or two places giving rise to piles of debris on the crater floor. The 16 km diameter crater Bessel on the floor of Mare Serenitatis and shown in the image below is an excellent example. One of the most interesting of lunar features, visible in the lunar image on the floor of Mare Fecunditatis, are the pair of craters Messier and Messier A, 14 and 11 km in diameter respectively. This bizarre crater pair was formed by the grazing impact of a projectile coming from the east which excavated the elliptical crater Messier and ricocheted to form Messier A. The two streams of ejector visible to their west, and shown below, show up best nearer full Moon (as in the image below) but, pleasingly, are just visible in my image. Better seen on lunar day 3, the crater Petavius is 177 km in diameter and so one of the larger lunar craters. ‘One of the finest spots in the Moon, the grand double rampart on the east side is nearly 11,000 ft (3,400 m) high and its terraces, interior floor with central hill and cleft compose a magnificent landscape’. 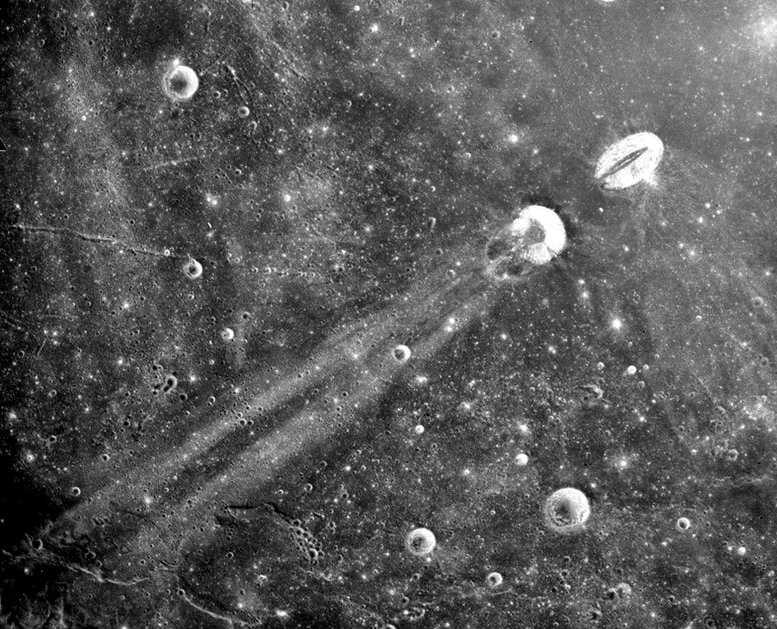 The ‘cleft’ mentioned extends southwest from the central mountains to the rim and is seen in the image below taken by the Lunar Reconnaissance Orbiter. The three craters, Theophilus, Cyrillus and Catharina, all ~100 km in diameter, are seen well in the image and show a sequence of erosion with Theophilus obviously the youngest and with their ages increasing significantly from north to south. The image below is a crop from the annotated Day 6 image above. There is a wonderful image of this region taken by Paolo R. Lazzarotti taken with a CF-315 mm aperture telescope of, I believe, his own design. It can be found at https://i.ytimg.com/vi/SmthhsJ3aZc/maxresdefault.jpg. In other essays in this digest I have showed how I have taken lunar images in the infrared (as that on which this essay is based) with a 127 mm refractor. I do have a 350 mm telescope and one of my major objectives is to attempt to take lunar images of this superb quality.